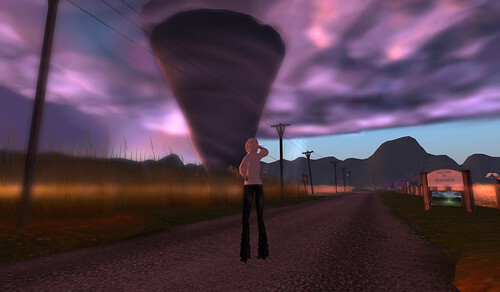 I have to say, now that I have an exploring buddy again, my evenings in SL are pretty busy! 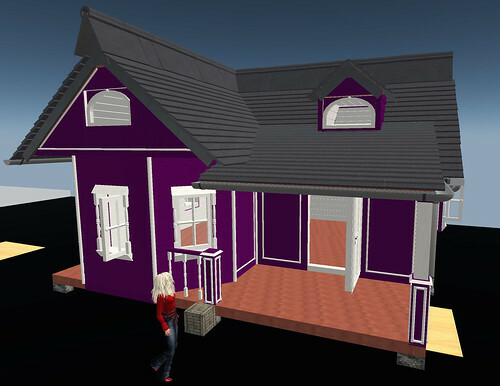 So, my friends all know how much I just love love love prefabs in SL. I can’t help it. I love to go walk through houses, I love to buy houses on sale on XStreet [OMG, I can’t stop myself, especially if the house is on sale! ], I get giddy when people drop houses on me to review, and I just love to pull them out and look at them. I almost never USE the houses I buy, and God knows I can barely remember what’s in my inventory, but I like knowing they’re there. So tonight, Rune and I were hanging out and he asked me the most wonderful question any man could ask me. [17:28] Runestar Twine: want to go looking at houses? We saw sooo many houses and other prefabs tonight. Omg, I cannot wait until summer comes to Bluebonnet [probably around mid-June, we’ll go beachy] because I saw the most marvelous prefab that will replace my park. It was so fun! And the fact that he stuck around even after hearing me squeal about all the cuteness I saw says a lot about him. 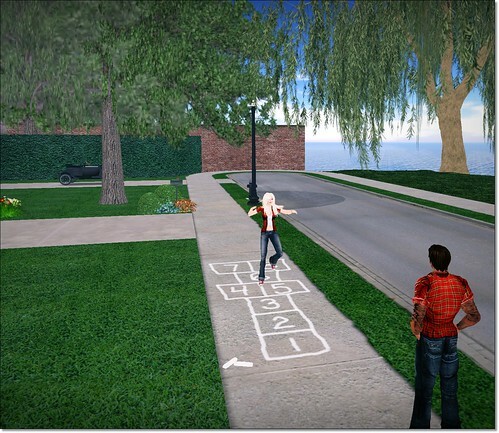 Of course, who wouldn’t stick around with a girl who stops to play a game of hopscotch? I’m sleeeeepy, so I think it’s time to tuck into bed with my phone and with Kirstie Alley’s Big Life. Well, now what do I do with it? I love Plurk because my buddies there post all kinds of interesting things that I can look at and blog later. Today’s odd thing came from Quaintly, who was looking around on Xstreet and came across this free house. There’s a lot of free houses on XStreet, that’s not so odd. 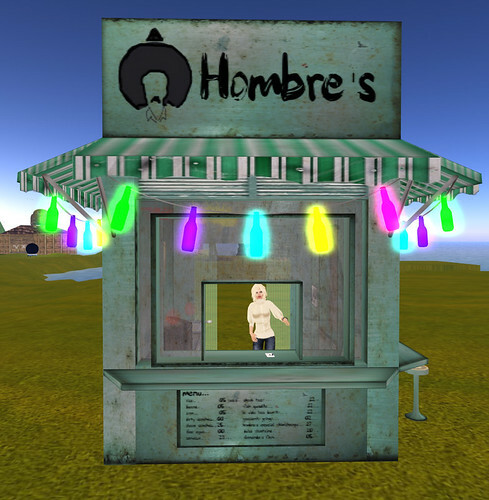 But this one… was 2308 prims. Every single piece of this build is a prim. 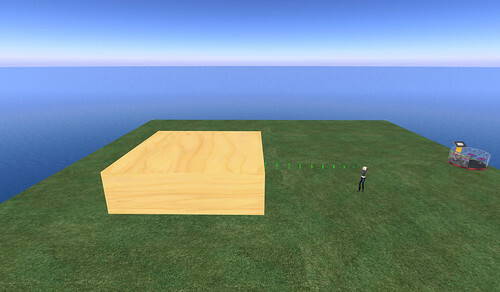 No sculpties, no textures, just prims. It’s even got frame work that you don’t see, much like a physical world home. Just the door alone is 88 prims. Now, I don’t want to complain too much about a free house. This obviously took a long time to do. But…well…I kind of have to wonder why someone would make something so high prim, it would be almost impossible for people to use. Also, it’s pretty small inside. It’s cool because all the windows open and close, but still. 2308 prims. My entire house, including furniture, landscaping and random boxes I have lying around comes in at just over 1300 prims. 2308 prims. For one tiny house. Holy cow. It’s a bad habit, and one that I really need to break. So last night, Quaintly asked me if I knew where to get a colorful skybox. That, of course, led me later to Xstreet to see if anything was new. I have a problem, I know! When I pulled up the residential structures, it had them listed from the highest to the lowest price. The first house listed was $30,000L. Holy cow, seriously?! Being nosy as hell, I went out to the store because they said that there were demos you could rez. And sure enough, there were, so I rezzed one out. Yep, you’re looking at $30000L worth of house. But anyway, it’s… well, the house is PRETTY. I won’t say that it’s not. I just don’t know if it’s $30,000L worth of pretty. I guess if you’re into having the most expensive stuff ever, this would be the house for you. But I can think of houses I like better that are cheaper. It’s time to go clean out the kitchen. Pray for me. LOL! Ali’s Thanks of the Day: I’m thankful that despite how cranky and crabby I’m going to be, I have completely supportive friends who say that it’s ok if I yell at them for the next few days. My friend Bon is really good about just dropping landmarks on me for nice little places he thinks I might enjoy exploring. Today’s exploration took me to the charming little area of Butterdish. When I teleported in, I waited for a few minutes for it to rez before really looking around. Once I looked, I knew I was in for a treat. How many other places do you go where you land almost in the path of a twister? In my physical world, I live in what’s commonly called “Tornado Alley,” so not one to shy away from a tornado, I went to meet the storm head on. There’s a sign nearby that says to go into fly mode, and then click the sign. Once I did, I couldn’t stop laughing. Soooo funny!! I did that for ages. I’m easily amused. The rest of the area is pretty much awesome. It’s very country, but just so pretty. I kept my lighting mostly at the region default the entire time, with a couple of times using the windlight preset Annyka’s Soft Lavender Day when I needed a little more lighting, like in the bakery. Check out some more pics! One of the cool things out at Butterdish is that some things are for sale! In the bakery, you can buy some of the cakes, and I even bought one of the cabinets. I don’t know where I’ll use it, but it was only $23L and just as cute as could be. In a little shed, there were – and you all know how much I’m addicted – but there were PREFABS. And not just any prefabs. Cute little prefabs I have no use for but that were dirt cheap!! I ended up buying this absolutely adorable skybox for just $30L, which I didn’t get pics of, and then…I saw it. For $30L, it could be mine. I forked over my $Lindens and ran home. My very own taco stand!! With my very own taco hat!